I’ve read that dressing from head to toe in one color is slimming, and God knows after all the junk I’ve been eating (and drinking) lately, I could use a slimming outfit- so here I go. Unfortunately, in my outfit on the right I look a little plain and awkward. Part of it is the bulge of my belt under the sweater. It looks like I’m packing heat! I’m not, I promise!! 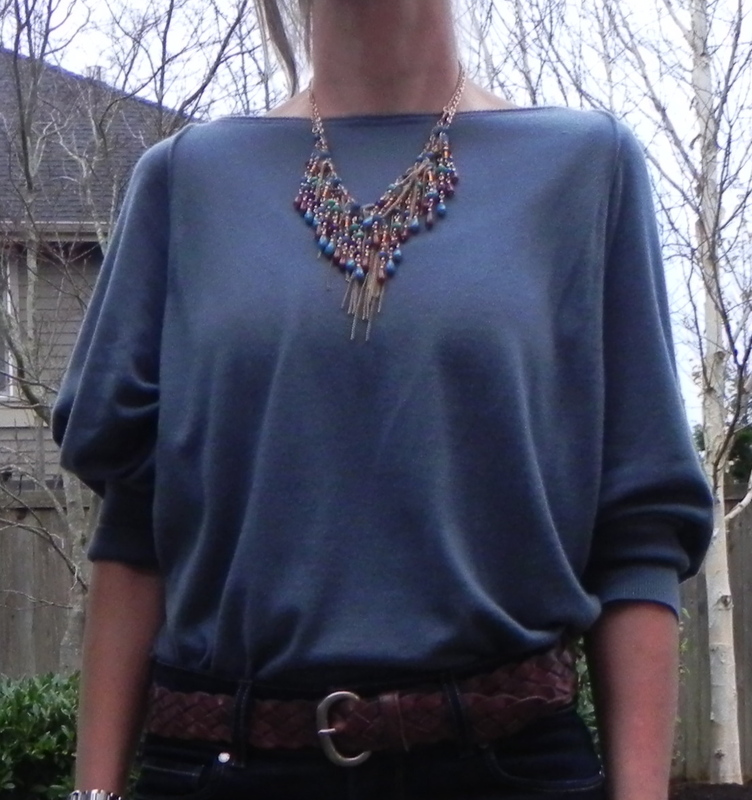 Since I’m pretty much all blue- it’s important to have something different about my look- hence the necklace. I picked up this little number at Forever 21- one of my favorite places for cheap jewelry. Go often though- sometimes it’s a total miss! Just to give the outfit a bit more shape and definition, I’ve also tucked in my sweater showing off this cool braided belt. Another simple and easy outfit using only a few items from my closet! The colors of the necklace add some interest to my otherwise plain look.